This beer was brewed on 06/07/15. The name on this one is a bit of a joke that anyone who frequents beer trading forums will get. Whales are those hard to find rare beers that people go nuts trying to acquire. ISO is In Search Of on the forums….so you get the picture. I’ve been waiting to do a beer like this for a loooooooooooooooong time. I’ve been on a string of light colored ales lately, so it was time to bring in something black. I guess the only things really holding me back from brewing a monster stout like this was whether I wanted a ton of imperial stout around the house since I don’t drink a ton of stout, and the cost of a beer this big. Those concerns where alleviated when my friend David offered to split the batch with me. With the financials out of the way I needed to decide just what kind of stout I wanted to do. I’ve brewed a few stouts to date, though only one has been on this blog. My coffee milk stout, Voodoo Rookin Phantom, was a pretty big success for me, but I wanted to do something different. I figured I’ve done coffee in that beer with some success, and I was tempted to use it here. I wanted to work in some other flavors though, especially a bourbon barrel feel. Its easy to throw a whole mess of ingredients into a beer and hope it turns out great, but finding the balance is key. I know that bourbon, toasted French oak, and vanilla beans are going to go well together. I also thought cocoa nibs might accentuate the chocolate malt flavors in the beer. I was soooo tempted to add coffee here, but with everything else going on in this beer I felt it may be over kill. In the end, I decided to add 4 oz cocoa nibs, 2 vanilla beans, 2 oz of medium toast French oak chips, and 8 oz of Elija Craig 12 year bourbon. I did a bunch of looking into how much of these various ingredients to add into this beer, but I’m sure it’s going to be a trial and error sort of thing. It seemed that a cup or so of bourbon seemed to be the consensus for a five gallon batch. Since this was a bit bigger, 10oz, a cup and a quarter or so, seemed like a good number. My LHBS didn’t have oak cubes so I went with the French oak medium toast chips. French oak medium toast are supposed to be milder, so I figured that would be a good place to start since I had never used them. I went with 2 oz since chips supposedly impart a lot of oak flavor very quickly. I’ll admit I’m a bit of a novice when it comes to bourbon, though I do enjoy a good sipping bourbon on the rocks. I figured I needed something better then a bourbon like Jack Daniels, but something that wouldn’t break the bank. After all, this is going in a beer. While the bourbon needs to be good, I’m not sure I’d be able able to tell 10oz of world class bourbon from just good bourbon when its in 5.75 gallons of imperial stout. My friend David, who enjoys his bourbon and is splitting this with me, recommended Elijah Craig 12 year. I had a couple fingers of this with an ice cube on brew day, and it should do nicely. It has just a bit of heat, but some great flavors that should go with the stout very well. I had heard about oak chips adding a lot of harsh wood flavor, so what I did was soak the chips in Jack Daniels for a month prior to brew day. The thought here is that the Jack will soak up any of the harsh flavors. I then soaked the chips in the Elijah Craig for 3 weeks. The vanilla beans and cocoa nibs seem like fairly standard amounts from what I’ve seen online, but again I have no personal experience with them so we’ll see when this beer is done! The ingredients were added to the chips and bourbon 2 weeks after brew day and will soak for a week. The whole chip/bourbon/nib/bean mixture will be added to the secondary and left to sit for a week prior to bottling. After I had the flavoring figured out, I needed to pick out a recipe for the base beer. I looked at the recipe online for a Founders KBS clone and that seemed like a good place to start. 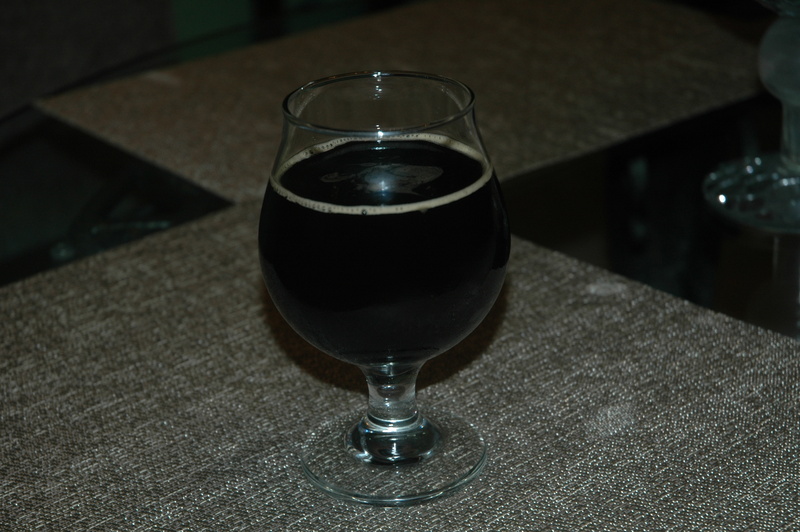 I also looked at a number of other imperial stout recipes, and I eventually settled on what I used for this beer. I wanted a decent amount of chocolate flavor to compliment the cocoa nibs. I also wanted the beer to be decently roasty to get a bit of dry coffee flavor without actually having to add coffee. I used a bit of crystal 120 to add a hint of sweetness, and a bit of carafa III for color. The oats will lend a silky body to what I expect to be a nice chewy beer. The brew day was nothing outside the usual. I was pretty on point, though I wasn’t sure what to expect with a beer this big. I maxed out my 8 gallon mash tun, and that was even with getting 4 pounds of fermentables in after the mash. I used 3 pounds of light DME to compensate for lowered efficiency with a huge grain bill, and I used a pound of sugar to help the yeast out. My efficiency wound up being 62%. I boiled this for 100 minutes to concentrate the liquid to get close to my expected OG, but I still came up a bit short. I was initially trying to hit 1.110. I actually hit 1.100 on the dot, so I’ll be anxious to see where this beer finishes. I adjusted the recipe below with those numbers. I chilled and pitched two packs of S 05 American Yeast. I thought about using one of my usual suspects, like Conan, 1318, or WLP 007 as far as yeast goes, but I didn’t want to make a monster starter and I wanted something neutral. *Note: Due to the nature of conditioning this beast it’s probably going to be a while before I can post tasting notes. I’ll probably crack one open at the end of summer and post my initial impressions then. I’ll do another post with my impressions on how it’s aged around winter sometime. Update 06/18/15: I transferred this beer to the secondary today on top of the bourbon/oak/vanilla/cocoa mix. The aromas coming off of both the beer and the bourbon mix were incredible. I took my hydrometer sample and wound up drinking the whole thing. The sample came in at 1.024 giving me a 10.1% ABV! The sample was obviously rough for a big beer that young, but the chocolate and roast coffee like flavors were already nice. The bourbon mix will bump the ABV up to 10.6%, and I can’t wait to try the beer with those added flavors at bottling in a week. Tasting Round 1– 08/25/15: This is the first round of notes for this beer, after its got a bit more age on it, I’ll post again! Appearance: What you would expect from a beer like this. It’s jet black with a thin tan head that quickly fades and clings to the side of the glass. This beer just looks thick. Smell: The aroma of this beer is fairly complex. The nose is balanced between bourbon, a bit of oak, chocolate, and a just a hint of vanilla. There’s some coffee like roast in there as well. Its a nice smelling beer for sure! Taste: A good mix of bourbon, oak, and dark chocolate are what stands out the most initially when this beer sipped. The bitterness is just enough to balance this beer, but there’s not much in the way of hop flavor in this. There’s still some heat from the alcohol, but this beer is still young for how big it is. There’s definitely some coffee flavor from the roasted malts, but its not overpowering. The oak flavor could still use some time to mellow, but it’s not harsh and doesn’t overshadow the other elements. This beer should continue to come together with more time. I’m surprised I’m not getting much vanilla in this. I can detect it, but if I didn’t know it was in there, I might miss it. Mouthfeel: Nice thick and chewy body on this beer. The carbonation is maybe just the slightest bit high for the style, but I’m being nitpicky. Overall: The beer could use more time to age, but for a beer this big, I’m really happy with how this one is coming along. I can’t wait to have more of this when the late fall rolls around. I think this will be drinking really well by then. I’m very happy with the base beer as well, and it’ll be fun to play around with other fun ingredients with future batches. This isn’t my final review of this beer, check back in a few months to see how it’s progressing ! Tasting 04/23/16: Lets try this again with almost a year of age! The appearance and mouthfeel haven’t changed, but this beer has come a long way in a year. Dark chocolate is the predominant flavor, while the oak and bourbon have taken to the background. I’m getting only faint hints of vanilla. Some flavors from oxidation have set in, but they are pleasant in this beer. This thing is basically a chocolate bomb though, and while that’s not a bad thing, I wish there was a bit more nuance to it. Still, I’m excited to see how this thing continues to age!